A mother of grown children developing a new pathway for her career. A member of the New Hampshire National Guard who coaches youth hockey part-time. A local police chief who puts community first. A young professional working in education. These hardworking citizens of New Hampshire are earning their degrees online from Granite State College. Adding to the personal and professional value of their degree is the announcement from U.S. News & World Report that for the eighth year in a row, Granite State College has achieved a top-100 ranking for its online degree programs. U.S. News & World Report evaluated online bachelor’s programs based on four categories: engagement, services and technology, expert opinion, and faculty credentials and training. For online graduate programs, student excellence was also considered. For online bachelor’s degrees, Granite State College is #76 among a pool of more than 1,700 institutions that were surveyed nationwide. The online graduate business programs (non-MBA) garnered a #94 ranking. Derek Reiss ‘19, a combat veteran pursuing a B.S. in Communication Studies, has completed more than 70% percent of his classes online throughout his studies at Granite State College. “For me, Granite State College was a perfect match. The class schedule fit my lifestyle, especially once I started a full-time job with the New Hampshire National Guard. I could continue my community involvement with veteran causes, spend time with my family and friends, and serve as a hockey coach for local youth leagues,” shared Reiss. Like Reiss, the ability to balance a full life and busy routine, while also a student, is the feature that Granite State College students appreciate the most. 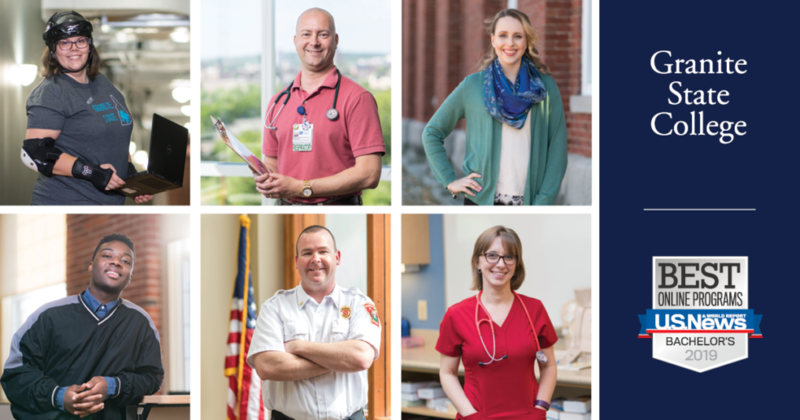 To learn more about Granite State College and its dynamic students and alumni, visit granite.edu/also-students.